Did you know fewer than one in 10 people have the skills to save a life? I began learning life saving skills when I was 10 years old. Over the years, I’ve carried out first aid several times on family members, including performing first aid for choking three times; on my mother, grandfather and my fiancée, who I’m sure would not be here today if not for first aid. I know just how important it is to have basic first aid skills through my personal experiences. I could give you plenty more examples from my professional experience working as a Nurse in the Emergency Department. First aid really can make a difference to a person’s chances of recovery. There are many reasons why people don’t learn first aid skills. One often overlooked reason is that it can feel quite daunting practising first aid and being assessed in large groups. You might dread being centre of attention as you have your first go at CPR on the mannequin. You might question your technique or worry about what people will think of you. For many people, taking first aid training is quite the comfort zone stretch. So you don’t do it. You hope that you’re never in a situation where you’ll need to use it. But what if you are? What if you are the only person around to help someone? Someone you love perhaps. Just like I was. 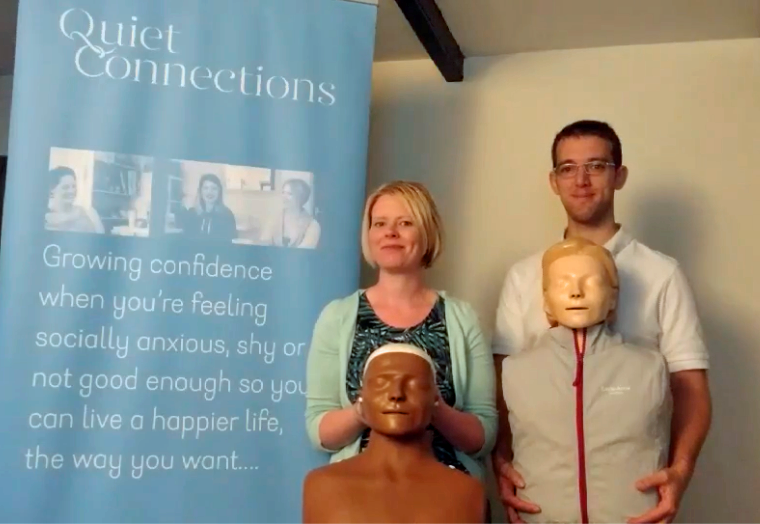 We’re teaming up with Quiet Connections to teach life saving skills to people in Cornwall who wouldn’t normally access this vital training due to feeling anxious about joining a group to learn and be assessed in first aid. This is a recognised qualification lasting three years. Quiet Connections is all about offering safe, supportive opportunities to take a comfort zone stretch amongst friends – and this is the perfect opportunity to have a go at something new. Working together, we aim to create a calm and supportive space where participants can comfortably digest their first aid knowledge and feel at ease practising their new skills in small groups with two or three other people who share similar challenges, mostly from Quiet Connections’ existing community. The Level 3 Emergency First Aid at Work course will take place at Cafe Chaos in Truro on Sunday 22nd October from 10am to 4:30pm. There are limited spaces available. If you feel you would benefit from this training, please go to QuietConnections.co.uk/FirstAid to book a place.